In West Yorkshire, but accessible - not too far down the motorway. This was somewhere we had always wanted to go, so when the party came up we were super-excited about going. We were not disapponited. You get 2 hours of going on all the things at Diggerland (including operating the diggers and dumpers, driving the mini landrovers and going on the rides - height restrictions do apply on some things.) This is followed by 45 mins for party food. The children can go back into the park after the party if they want (with parental supervision). What a great place! An outdoor woodland party where the children can practise their woodland skills. 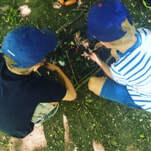 There are a range of activities you can choose from such as (to great excitement) building and lighting a fire, building a den, scavenger hunt, magic potions and more...Following the activities, you go down to the great outdoors (undercover) wooden eating area where you toast marshmallows and have party food (hot dogs, crisps and chocolate). The kids and adults loved it. Ages: 18mths+ (Under 5s need to be accompanied by 1 adult to 2 children. 5-13 year olds need to be supervised) Minimum 10 people. Organised bouncing around on trampolines with some other activities including dodgeball and balancing on the beam above the ball pool. A lot of active fun. The children get special grippy socks to wear and after a short safety video, they are good to go. ​There are a variety of options for food. Parents get to sit upstairs where they can have a coffee watch the fun. The party organisers took charge of everything and made sure the children were well looked after. The bowling parties have always been fun. The children love the opportunity to roll / throw a really big heavy ball down the bowling lane to try and knock over / destroy the pins at the end...You can put the spacers up at the side of the bowling lane so that the ball won't fall in the gulley. A game or two of bowling followed by some party food has always been a popular choice. Location: Hull Ice Arena, Hull. 12-30 People. ​This is the most enormous bouncy castle and the kids love it. It is split into different areas, including ball pools, slides, gladiator duelling and a bit where you can pull yourself on elastic to try and shoot a hoop. Members of staff will accompany the children to help / keep an eye on them. You first have a safety briefing, then you get an hour of bouncing, then food. You can have 10-20 guests. For teh food, there are very tasty pizzas on offer from the Wellington Pizza Pub just around the corner which they bring in. Adults can sit upstairs or downstairs with refreshments from the cafe. The party organisers were great. All very stress-free. To have an Invictus party, the birthday child has b=to be a student at Invictus, however the party guests do not have to be members. The party is involves a mini martial arts class, some martial arts games, more games and ooh la la cutting the cake with a samurai sword. Food and drink as well. An interesting and fun party. I am sure all parents are familiar with soft-play places. We have visited Kinderland many times over the years and the kids have always enjoyed it. We have found parties that were held at more off-peak times better in that it was quieter. After school has been good - on some occasions we have almost had the place to ourselves which has been great. An hour of running around then food, then home for a good night's sleep ticks a lot of boxes. Location: up to 60 miles from the centre of hull. You need to provide the venue and food. Lab Rascals provide a variety of science parties, which cover things like making slime, bath bombs, bubbling potions, fog and smoke. There are a variety of options available. The kids thought it was a whole load of fun and were most excited to wear their lab coats and safety goggles. The party organisers kept the children engaged and interested the whole way through. They will also provide party bags if you wish. Educational party fun. Love it. This is the easiest birthday party. 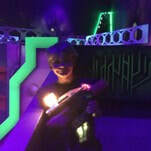 The children go into the laser quest room and the door closes behind them and you don't see them again for 15 minutes. They come out for a drink then back in for another 15 minutes. 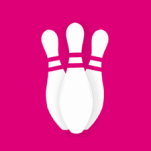 There are a variety of packages available, you can add on bowling if you wish. The party organisers are excellent and very adept at keeping a bunch of over-excited, hot sweaty children under control. The children love it. The parents love it. Winner. Lots of sciency stuff delivered in a way that will keep the children interested and entertained. Chemical reactions and interactive demonstrations followed by making something to take home. Soft play party. Megafun is a good soft play venue. Big and airy with lots of different things for the children to go at. Play for 90 minutes then a selection of decent food. 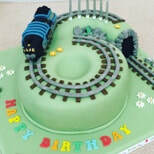 They also offer themed parties, gymnastics parties and traditional parties. A private cinema screening and your own personal montage on the big screen before the film! Some party games before the film and then the movie. You can supply your own food. Party bags with sandwiches and tasty snacks were given to the children at this party during the movie which went down very well. Not in East Yorkshire or Hull, but accessible (not far over the bridge) and a great party so it goes on the list. Pink Pig Farm is a favourite haunt of ours. The first time we went, we couldn;t beleive we hadn;t been more often. 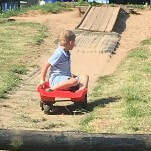 It ticks such a lot of boxes for the children - ride-on tractors, hay bales to play on, water pumps, toboggans on wheels and more. The parties are well organised and include an hour of outdoor play with a tractor trailer ride, small animal handling and feeding the alpacas, goats and sheep. They also offer more party options including a science party in their new science barn and a nerf party. The parties also include tasty homemade food. Location: Yorkshire. You have to provide the venue. ​You can't beat a bit of magic. Puzzling Paul is an excellent magician who has been keeping the children around Yorkshire entertained for years. He is excellent at keeping the children interested and under control. His magic tricks are wonderful and will keep children and adults guessing as to how on earth he did it! He will also organise party games if you wish and make balloon models for the children. 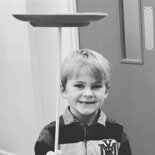 They can even have a go at plate spinning! A lot of fun for all ages. 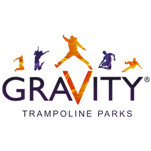 ​Well-organised trampolining fun. Following their safety briefing and equipped with their grippy socks, Kids bounce around for an hour, burning off all their excess energy, followed by decent party food upstairs. Parents can watch from upstairs or downstairs. Rock Up is another very good stress-free party. 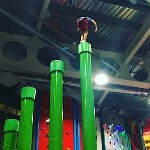 The indoor climbing walls are great. The children get kitted out with their harnesses and following a safety briefing, get to climb to their hearts content for just under an hour on 26 different climbing walls.. As there is a finite number of spaces available for climbers, this means that it will never be too busy. There are assistants in the climbing bit to help clip and unclip the children. Following the climb, the children go to their own party room for food. Parents can watch from downstairs or upstairs. 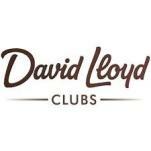 (There is a soft play party option for children under 4) Good, active, organised fun. This party is great fun. An hour of football, organised by the Tiger's Trust staff, followed by food and drinks in the party room. Parents have to provide the food and drinks. At the last party we went to there, pizza was ordered in which seemed like a very good / easy idea. Roary the tiger also presents a signed football to the birthday child. Perfect for football keen children. There are 3 types of parties on offer here: a land-based party (archery / team games etc.) , water based (sailing, raft building etc.) and a pirate party (big boats on the water dressed as pirate ships and a huge water fight. Jetty jumping can also be done at the end. We went to a pirate party and it was great. 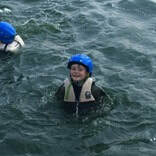 The kids get togged up in wetsuits and lifejackets then off into the boats. The day we went was the hottest day of the year so the children were dying to get in the water to cool off. They had such a lot of fun in the boats and the water fight and loved the jetty jumping. There were also some land-based games which were fun. It was very well-organised with lots of staff involved to ensure the safety of the children. You have to provide your own party food, you can hire their kitchen or the BBQ. Great fun. William's Den is another favourite haunt of ours. Just near North Cave it is a great place for children and adults. 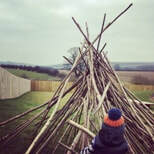 The outdoor play area overlooks the rolling hills of the Yorkshire Wolds and has lots for the children to go at including water pumps and sand, tyre swings a zip slide and more. There are also lots of tables outside so the adults can sit and enjoy a coffee. Inside is also very exciting with more water and sand and things to clamber about on. The parties are well-organised, with the children having 1 1/2 hours of free play and also organised activities such as den-building or a zip-wire challenge. The party food is very good with a selection of pizzas and chips and homemade ice-creams on offer.